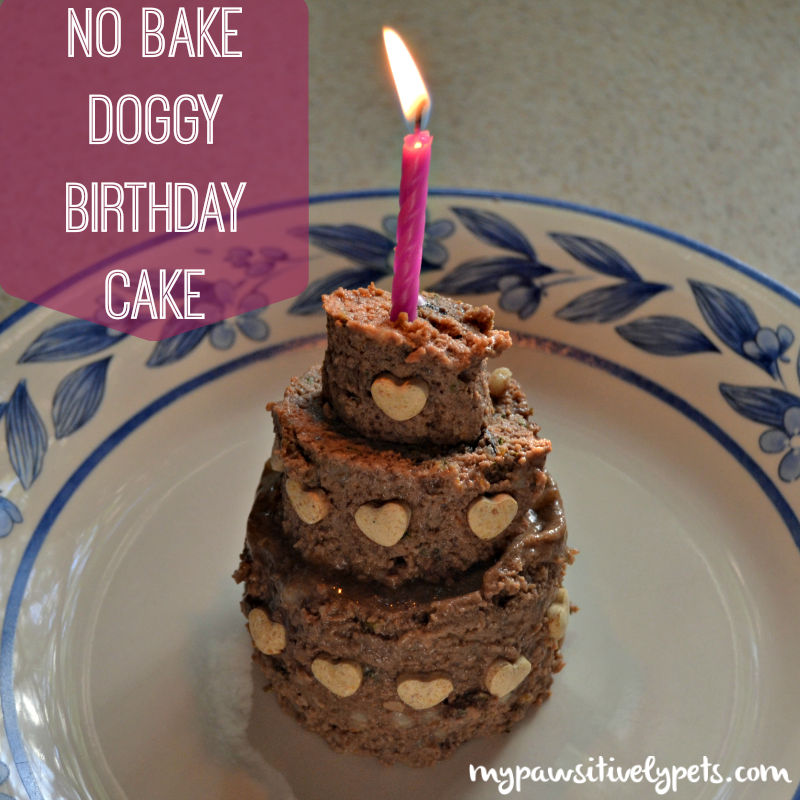 Looking for an easy and inexpensive alternative to baking a fancy birthday cake for your dog this year? I'll admit that I'm not much of a baker. This week was Shiner's 11th birthday so I came up with a creative way to make her a special birthday cake without having to bake anything. And it cost me just a few dollars to make too. 1 Can of dog food - make sure it's a "patte" type dog food that will come out of the can in one shape. The trickiest part about this doggy cake is trying to get it out of the can in one big intact cylinder shape. It took me a bit of time to carefully ease it all out of there. I bought an extra can of dog food, just in case I messed up on the first try. After you have the dog food out of the can, slice it into 3 sections. These sections can be as thick or thin as you like and might depend on the size of your own dog. Place the bottom layer on a plate or food dish as is. For the second layer, simply trim away some of the edges with your butter knife so that it's slightly smaller than your first layer. Do the same thing for the 3rd layer. Carefully stack all the layers together and voila! 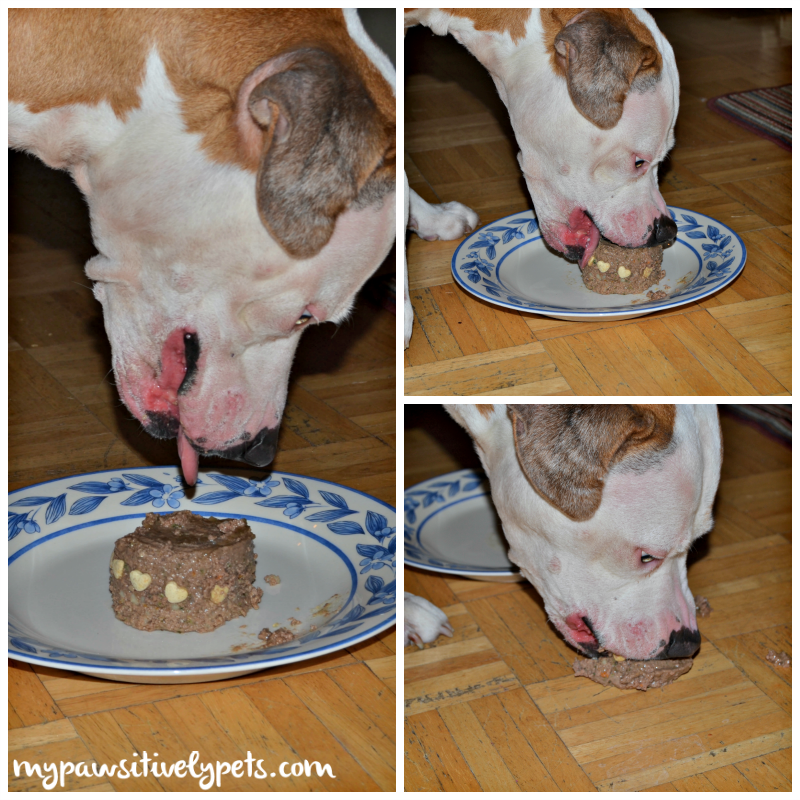 You have yourself a 3 layer no bake doggy birthday cake! To make it extra special, I added some treats to Shiner's cake. I used what I had on hand. The heart-shaped treats are Valentine's Day Edition Quickies from The Honest Kitchen. I topped it off with a candle and we sang a little birthday song before Shiner was allowed to dig in. Please be careful with the candle. Dogs and fire don't mix, and the candle is really more for the purpose of photographs. She was watching me oh-so intently as I prepared this extra special meal for her. There was no way she was going to sit there and pose for a photo with her cake, so I quickly snapped some photos of her eating her birthday cake. As you can probably see, she thoroughly enjoyed it! 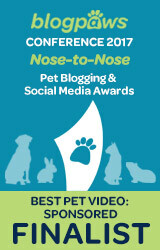 Do you do anything special for your pet's birthday? Bake a doggy cake? Give gifts? Take an extra special walk in the park? Let us know how you celebrate in the comments! That was just a wonderful Birthday cake and so filled with the right stuff! That is a great idea! Like Shiner, Tater would woof it down too....lol. Fabulous idea Ann! Looks like Shiner thoroughly enjoyed it! Yea Shiner might have eaten that candle too if I didn't take it off! It looks like she really enjoyed it. I always intend on making a small cake or cookie for Kamana for his birthday, but never get around to it. He's spoiled enough anyway. It looks so good. I'm definitely trying this recipe. Thank you for sharing it. Have a great weekend! Such a cute quick and easy idea! I usually try to make Luna something special and go on an adventure close to her birthday. Coco's 4th birthday is next week and I was just thinking about look for a cake recipe. This looks perfect! I'm sure she'll love it. And because it isn't expensive, I can make one fore each dog that comes to her party! Shiner looks very happy with the cake! Way to go! What a sweet thing to do! I'm sure we would like a cake like that. We don't eat canned food, but we hear dogs love it! Shiner doesn't eat it that often, but it was a special occasion. What a cute and easy idea! Is there a kitty cake? 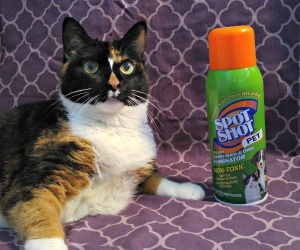 This could totally be done with cat food too Noodle! Ah wow! That's a great idea!!!! I might have to try that in April when kodas first birthday comes!!! Thanks! What a great time saving idea!! I love the heart shaped treats decorating the cake. 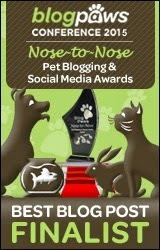 This will be happening at my house for the next dog celebration!! Thanks for sharing! Bark More, Growl Less Barking from the Bayou! That is super cute, and so clever! How creative! What a great idea. We might have to try it this year! Much love, The Scottie Mom. That was very creative!! We don't always do a lot for birthdays, though I have started at least giving them a special treat and a new toy or something like that. Wow, that is such a good idea. Thanks for this for our doggie. We sure will give it a try. Have a great Sunday. Beamer would love a no bake birthday cake! I'd be interested in seeing how that turned out!